In order to update the plumbing and wiring, as well as execute structural repairs it became necessary to remove a significant amount of the interior cabinetry. As with most of my projects, that led to another. It turned out that much of the wood was significantly damaged by long-term water leakage. The exposed side was typically in tact, but the underlying laminates were in some case completely rotten, or mildewed. I'm a long way from even dreaming about performing any interior woodwork, but it doesn't hurt to list some of the projects I have in mind. Add small storage bins to open bulkhead cavities: There's some nice space for small items on each side of the main cabin's aft bulkhead. 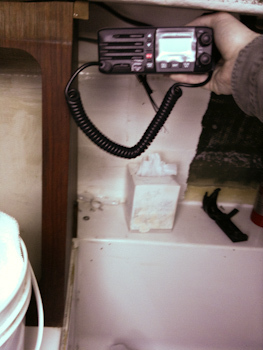 Every little nook is useful. If nothing else, it would be nice to make an access panel. Replace hinges on head / bulkhead door: The bathroom (head) is pretty awkward to get into right now because the top hinge is broken. As a result, the door is crooked and jams. The existing hinges are pretty weak, so I need to fill the existing holes then add beefier hinges. Expand cabinet slots to fit dishes: There's a nice set of slots in the cabinets to store dishes, but the dish set that came with the boat doesn't fit in them. A little quality time with a router and we should be making better use of the space. Improve method of securing dining table: The dining table is held in the upright position by a bent stainless barrel bolt which has no strike plate. I'd like something less obstrusive that's not bent. 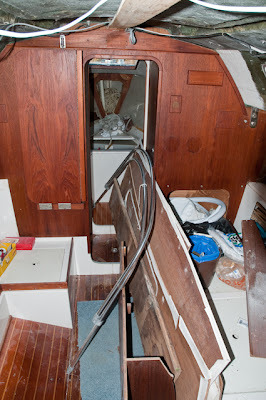 Add storage to underside of companionway stairs. There's a huge amount of storage space behind the stairs. I'd like to add something to securely hold items in place, possible with nylon strapping. It has to be very secure so nothing goes into the engine. I'm even considering some lightweight glass work for this. Build custom electronics cabinet: I want a sleek built-in look for the primary electronics. There should be plenty of room right next to the wet locker on the port side. it will just shorten the shelf area a bit. No big loss. Very few stock ice boxes are insulated to the level they should be. The box on the CS27 is quite large for the boat's size, and provides plenty of room to add insulation while still leaving plenty of usable space. I intend to do just that.